Avatar from Stockholm are not that well known outside their native country where they have already built themselves quite a reputation. 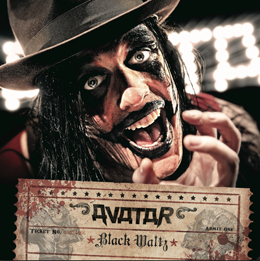 After releasing three albums, Swedish metal band Avatar is back with their fourth full-length album Black Waltz. Avatar surprise with overwhelming song writing and a lot of variation.. Although it has a strong industrial Manson versus Ramstein touch, it’s comes across very refreshingly. It’s just fun listening to the entire album. When it comes to contemporary metal music, Avatar is a band that must not be ignored. Their music is so rich and diverse that there should be a broad audience finding interest in Black Waltz.